It is hard to believe that my time in Israel is coming to an end. It has been an amazing few weeks. (Video, pictures, links and formatting to be improved when I get home). 1. Just being in Israel just a year after my last trip. In the past there were several years between trips so being able to be here for several weeks in July for two consecutive years has been amazing. 2. On the Hartman tiyul (field trip) we went to this amazing moshav. 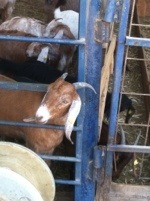 There they grow vegetables and have goats and chickens and make their own cheese using the goat milk. The meal was amazing, and the cheese was off the charts good. This experience defined eating local! For more info (this would be a great stop with a tour group for lunch or dinner) you can visit here. 3. One Saturday night (after Shabbat) I was invited to visit Bar Noar, a program run by the Agudah for LGBTQ teens. Some of the teens shared their stories. How they cannot come out to their families because of religious issues, the stigma that exists in Israeli society about coming out, and how much the program means to them, their self esteem, and their future. One young woman shared a song she wrote and then a group of us started singing Adele together. We didn’t stay too long, after all it is the teens’ program, but words can’t describe how much the short visit meant and the impact it has. 4. I actually had 3 ‘real’ Shabbtot. Time to rest, be with friends, pray, and laugh. 5. The Israel Museum has an amazing exhibit about Hassidic culture. If you are going to be in Jerusalem, I recommend it. 6. 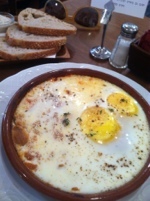 Shakshuka, the freshest produce that tastes amazing , amazing hummus, pita, salatim, and… I could go on but I won’t. 7. Time spent reconnecting with old friends and making new ones in various coffee shops and restaurants around Jerusalem and Tel Aviv. 8. Studying at the Shalom Hartman Institute with over 150 rabbis of every denomination. It felt so good after a year focused on education and pedagogy to get to study texts and not think about the other issues. 9. Spending some time with real-life hero, Rabbi Miri Gold. When the video is up, there will be a clip of her explaining what’s happening and happened with her supreme court case. 10. 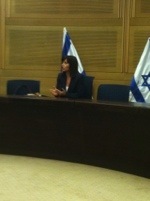 Visiting the Knesset and hearing from MK Einat Wilf. 11. 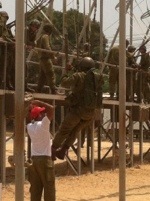 Tiyul to a military base where paratroopers are trained and parachutes are packed and cared for. I now know so much about parachutes and paratroopers. 1. Since when does everyone jaywalk in Jerusalem? Years ago it was like a game of chicken walking in a crosswalk. Now everyone crosses the streets in the middle of traffic no matter where or when! Super annoying, especially when driving. 2. Jerusalem is becoming increasingly religious and not in a good way. Areas that once seemed populated by hilonim (non traditionally observant Jews) seem few and far between. I heard more stories of Jerusalemites moving out of the city because of neighborhood issues. 3. Cinnamon ruggelah from Marzipan are even better than chocolate. 4. My Hebrew skills are better than I think. 5. I still have some PTSD from my year in Israel, 2003-2004. Whenever a bus goes by I feel an adrenaline surge. When I drive by memorials where terror attacks happened that year my heart skips a beat. I still can’t imagine getting on a bus. This doesn’t prevent me from doing anything really but it is more expensive. 6. I know of numerous people in Israel this summer (as heard that the tourism industry is doing great) shopkeepers are stating that business is down, and people might be here but they aren’t shopping. I didn’t run into one group on Ben Yehuda Street, the Mamilla shopping area, Emek Refayim or services at HUC. This seems strange and I am not sure what it means, if anything. 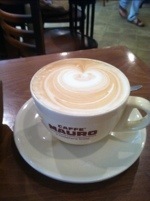 This entry was posted in Israel, memories, Peace, Politics and tagged Israel, travel. Bookmark the permalink.